Chicago police are still searching for a third person involved in the murder of off-duty Chicago Police Officer John Rivera. CHICAGO (WLS) -- Chicago police are searching for a third person suspected to have been involved in the murder of off-duty Chicago Police Officer John Rivera. Meanwhile, authorities said charges against two men already in custody could be upgraded to a hate crime. Menelik Jackson, 24, and Jovan Battle, 32, have each been charged with first-degree murder. 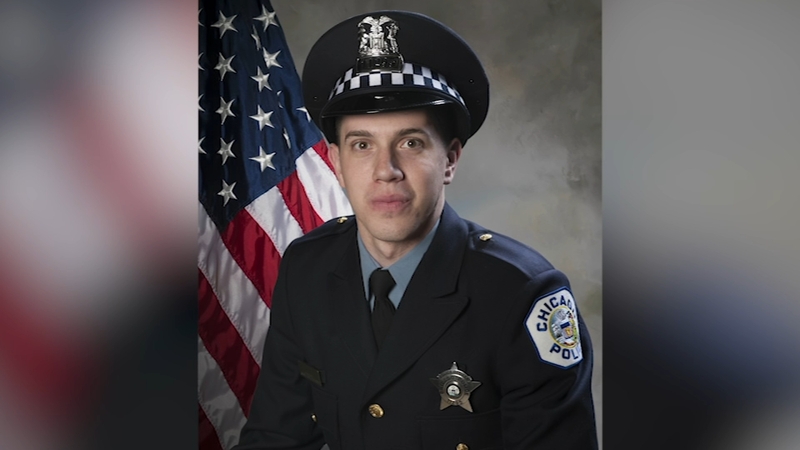 Police said Jackson fired into a car Saturday in River North, killing the 23-year-old officer and critically wounding another man. Police said Battle was a co-conspirator. The two men suspected of killing Rivera may have shot him simply for being Hispanic. This occurred after police said the men were involved in an unrelated dispute at the former Rock N' Roll McDonald's, which police say involved a group of Hispanic men traveling on board a party bus. Now, police say hate crime charges may be filed. "He was searching around for the party bus, the party bus had left the area, so I guess he settled for the first Hispanic he saw," Chicago Police Superintendent Eddie Johnson said. That night Rivera had been out with friends, including his girlfriend. She survived the shooting after the officer's final act of bravery, shielding her and others from gun fire.